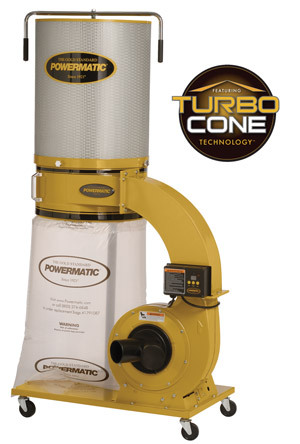 The PM1300TX-CK Dust Collector features the exclusive TurboCone™ which improves chip separation, large 10 cubic foot bag and a digital timer (up to 99 minutes) and remote control operation. The all-metal duct improves rigidity and air flow. Four castors are included for mobility.